The Bruin lab is primarily interested in studying the pathogenesis of diabetes, with a focus on insulin-secreting beta cells, which are located in clusters of endocrine cells within the pancreas called ‘islets’. More specifically, we are investigating how environmental factors (including exposure to pharmaceuticals, environmental toxicants, and disease states) impact the endocrine pancreas, as well as the influence of gene-environment interactions on beta cell susceptibility and diabetes. The lab uses a diverse range of complementary tools and approaches, including traditional animal models of diabetes (type 1 and type 2), unique transgenic and gene knockout animal models, and islet transplantation techniques. We are also utilizing the differentiation of human pluripotent stem cells into pancreas lineage cells as a unique tool for modeling human pancreas development in vitro. Current projects in the lab include investigating the role of xenobiotic metabolism enzymes in pancreatic islets, and screening for environmental toxicants that impact adult beta cell function and survival, as well as critical windows of beta cell development. 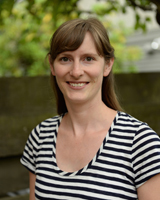 Read about Jenny Bruin’s work in our OIRM Research Profile.